The demand within the global market for fiber optic connectors has been rising on account of key advancements in the multiple end-use industries, finds Transparency Market Research (TMR). The presence of a large number of vendors in the global market for fiber optic connectors makes the market highly fragmented. 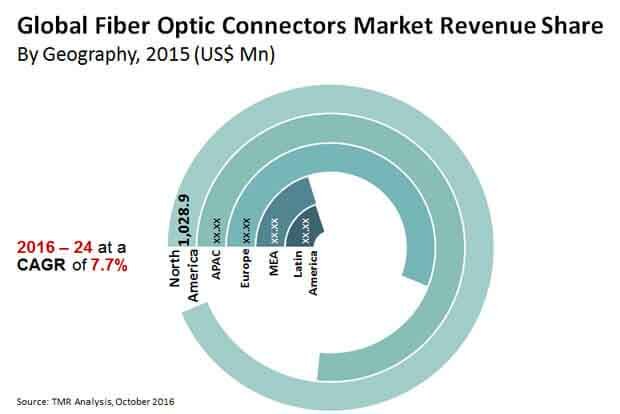 It is expected that the leading market players in the global market for fiber optic connectors would make voluminous investments to distinguish themselves from the smaller and amateur players. The leading vendors in the global market for fiber optic connectors have continually elevated their quality standards in order to attract consumers into buying their products. The small- and medium-sized market players in the global market for fiber optic connectors hav a large playfield to experiment new business strategies, It is expected that the small vendors in the global fiber optic connectors market would stick to the basics of marketing in order to enhance their growth prospects. The medium-sized players in the global fiber optic connectors market could benefit from tying up with the larger players ad getting access to a wider consumer base. Some of the key vendors in the global market for fiber optic connectors are Furukawa Electric Co. Ltd., ZTE Corporation, Hitachi Ltd., Corning Cable Systems LLC, Broadcom Limited, and Sterlite Optical Technologies Limited. A report by Transparency Market Research (TMR) finds that the global market for fiber optic connectors would expand at a healthy CAGR of 7.7% over the period between 2016 and 2024. The global fiber optic connectors market had a total worth of US$2.9 bn in 2015, and this figure is expected to touch a value of US$5.6 bn by 2024. On the basis of application, the demand for fiber optic connectors in the telecom industry has been rising at a stellar rate. On the other hand, the market for fiber optic connectors in Asia Pacific is projected to expand at a robust rate in the years to come. The need to ensure seamless communication through transfer of signals in the telecom industry has been growing in recent times. Fiber optic connectors are an indispensable part of the telecom net, and hence, the growth of the telecom industry is projected to drive demand within the global market for fiber optic connectors. Although various types of fiber optic connectors are available in the marketplace, there is no substitute for the base product. This factor has emerged as another key prospects for growth within the global market for fiber optic connectors. The demand within the global market for fiber optic connectors could be restrained by the high costs of these connectors. The per unit cost of fiber optic connectors used in the telecom industry often outdoes the benefits served by these connectors, which has become a major concern of the market vendors. However, the use of fiber optic connectors across data centers and datacom units is projected to keep enhancing the growth prospects of this market. Besides this, advancements in the domain of DWDM systems is also expected to propel market demand in the years to come. The review is based on TMR’s report titled “Fiber Optic Connectors Market (Types - LC (Lucent Connectors), SC (Standard Connectors), ST (Straight Tip) Connectors, MPO/MTP (Multiple-Fiber Push-On/Pull-Off), and MXC; Applications - Telecom Industry, Datacom, DWDM Systems, and Lasers) - Global Industry Analysis, Size, Share, Growth, Trends, and Forecast 2016 – 2024”.